Unilite has launched the PS-IL10R inspection light, which includes a total of 27 LEDs with an output of 1000 Lumens. When you pull out the PS-IL10R inspection light for the first time, you’ll notice two things. Firstly, how ergonomic the design is, and secondly, how bright it is. The most common way people discover the latter is when they turn it on, looking directly at the light, and dazzle themselves for the next 10 minutes! The body of the light is constructed from a blend of both strengthened polycarbonate and aluminium. It also has a strong rear magnet, freeing up both hands for user. Attached to the magnet is a 360° hanging hook, allowing it to be hung up in multiple positions. The 1000 Lumen output of the PS-IL10R comes from its Samsung SMD LEDS. The 27 LEDs provide an evenly dispersed light to help reach any crevice you need to see. The torch also provides flexibility as it can be used as a spot beam, which allows for more precise inspection; for example, looking at intricate holes in the wall. The PS-IL10R is powered by a 5000 mAh Li-ion rechargeable battery. This can be charged via a USB cable, avoiding the pain of finding working batteries! 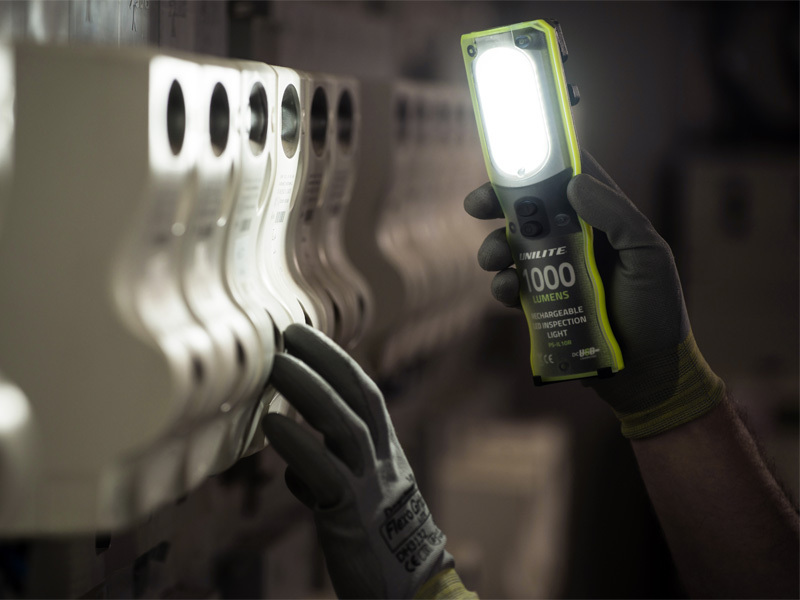 If it’s a strong, robust, pocket-sized work light you need to help illuminate your work space, then the PS-IL10R has you covered. Keep your eyes peeled on the PE site next week – you might just have the chance to win a PS-IL10R inspection light for yourself! For more information on Unilite, please visit: www.uni-lite.com. Integral LED | Bored of the Flies?